Two Indians CEO of Datawind, the maker of India's low-cost tablet Aakash, Suneet Singh Tuli and Massachusettes Institute of Technology (MIT) professor Anant Agarwal have been named among the top 15 classroom revolutionaries. Tuli(44)) is the " mastermind" behind the world's cheapest tablet computer Aakash, "which has the potential to revolutionise educational access in the developing world." Datawind has a backlog of "millions" of orders for the 35 dollar Aakash tablet. The publication quoted Tuli as saying that "I don't care about creating the iPad killer. I care about the 3 billion people who can afford this device." Agarwal, 53, a professor of computer science at MIT is also the President of edX, the new combined online offerings of Harvard, MIT, the University of California at Berkeley and the University of Texas. Over 400,000 are currently enrolled in the education programme. "We've created dramatic access to learning for students worldwide. By reinventing online learning, we can dramatically improve what we do on campus," Agarwal, who took over as head of edX in May this year, said. "EdX continues to up the ante by increasing partners, classes (seven to dozens for spring 2013) and innovations, such as virtual laboratories," Forbes added. 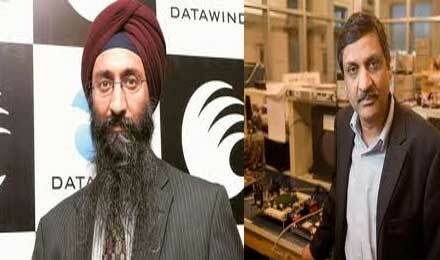 Datawind had won the tender in 2010 to supply one lakh Aakash tablets for a price of around 49 dollars per unit. A new version of the tablet PC, featuring one Ghz processor, four-hour battery time, capacitive screen and Android 4.0 operating system, is expected to be launched in India on November 11. Among the other education innovators on the list is Salman Khan, the Bangladeshi-American founder of Khan Academy, the revolutionary online education platform. The 36 year old M.I.T. and Harvard alumnus has so far created 3,400 videos, mostly science and math tutorials, that have been watched by more than 200 million people. Khan Academy's YouTube channel has more than 400,000 subscribers.